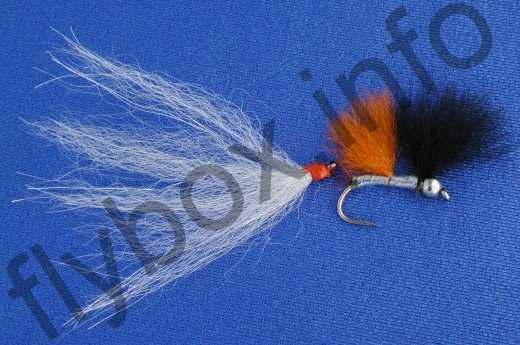 The Vixen-Fry should ideally be fished on a Floating Line with a leader of about 3 m (10 ft) or more. After the fly has sunk to the required depth, the retrieve should be in short pulls of about half a metre (2 ft),with light twitches inbetween. This will activate the tail section, adding lifelike realism. This fly is one of the most prodigious killers in modern fishing. Head : 3 mm silver bead. Tail section : A pinch of white arctic fox on the underside of a straight eyed hook. Then tie in 4 or 5 fibres of silver lite brite over which a pinch of white arctic fox tail is tied in. Whip finish head with red silk and varnish. Cut off the hook at the bend. Wind medium flat silver up to half way along shank. Tie in a pinch of orange arctic fox and trim to size. Continue winding silver tinsel to near the bead. Then wind medium mother of pearl lurex over the silver. Varnish. Body Wing : Tie in a pinch of black arctic fox next to the silver bead. Currently there are no comments about the Vixen Fry fly pattern from other fly fishermen yet.